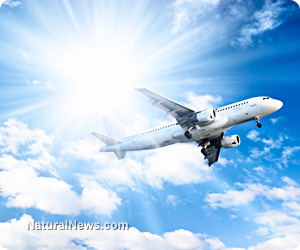 Nanosized aluminum being sprayed in the atmosphere, causing degenerative disease, says neurosurgeon | "Global Possibilities"
Back in the 1960’s, quiet scientific dialogue began about global climate change and how it can be manipulated. What might have turned into a productive discussion of responsible protection of Earth’s climate and ecosystem had eventually evolved into a mad, controlling science experiment. Essentially, there needs to be a massive public outcry against geo-engineering similar to the outcry against genetically modified crops. As the reality of geo-engineering takes hold and as the consequences mount, it’s never too late to stop the madness and work together for real grassroots environmental conservation. As these geo engineering experiments utilize military jumbo jets to unleash massive amounts of nanosized aluminum, strontium, and barium particles into the atmosphere, many may wonder if the global warming debate is just political distraction to gain public acceptance for the geo-engineering tactics. Many people are beginning to feel that these chem-trails are secretly employed to control and depopulate. After all, millions of unknowing people have become victims to these mass sprays, as they’ve become like fish in a bowl. Check your skies for chem-trails. The effects of greenhouse gases are real, but when did any group, government, or billionaire gain the authority to use jets to pour massive amounts of elements on unsuspecting populations of people? As much as their research sounds accredited, they have no moral authority and they have no idea what they are destroying as soil and plants soak up the mass sprays falling on them. When quiet discussions about climate change erupted in the 1960’s, scientists began tossing around ideas to combat global warming. By introducing sunlight-reflecting particles into the atmosphere, they could increase reflectivity slightly, counteracting heat-trapping gases, and thereby cooling the planet. Colombian Dr. Broecker’s idea was to introduce sulfur dioxide into the stratosphere in the 80s. By 2006, Dr. Crutzen, a Nobel laureate from the Max Planck Institute began publishing reports on how that might work to cool the planet. According to neurosurgeon Russell L. Blaylock, degenerative disease, especially neurological disorders like Alzheimer’s are growing at an alarming rate, due in major part to the mass spraying of nanosized aluminum into the atmosphere. Blaylock explains further that aluminum nano particles can easily penetrate the brain through the blood and olfactory nerves in the nose. Passing through the olfactory neural tracts, aluminum particles easily penetrate the area of the brain most affected by Alzheimer’s disease. Furthermore, in Alzheimer’s cases, this part of the brain has shown to contain the highest level of aluminum! The aluminum particles also enter the body through the respiratory system, where they have been shown to cause tremendous inflammation in the lungs, further aggravating conditions like asthma and pulmonary diseases. Due to their small size, the aluminum particles can even enter the gastrointestinal tract and can disperse into many other organs and tissues in the body, including the spinal cord.